Japanese Prime Minister Shinzo Abe appears headed for a third three-year term as ruling party leader, extending his hold on power and giving him time to pursue a long-cherished goal - revising his country's post-World War II constitution. Abe reportedly has the support of a large majority of party representatives ahead of the ruling Liberal Democratic Party's Sept. 20 leadership vote. "I will take on the task of revising the constitution, a postwar challenge that has never been achieved, in order to open a new era," Abe said Friday in a televised debate with his only challenger, former Defense Minister Shigeru Ishiba. The 63 year-old Abe, prime minister since December 2012, is poised to become Japan's longest-serving leader with a third term. He reportedly has the support of 70 percent of the 405 parliament members from his party, and is expected to win about 60 percent of the other 405 votes allocated to regional rank-and-file members, according to media surveys. With Abe's victory widely expected, the focus has shifted to who will get key party posts and Cabinet appointments, and his possible successor. A revision to the U.S.-drafted 1947 constitution is a decades-old pledge of the Liberal Democratic Party that none of Abe's predecessors has been able to achieve. They include Abe's grandfather, former Prime Minister Nobusuke Kishi, who saw the constitution as a humiliation imposed on Japan following its World War II defeat. Abe said earlier this week that he hoped his party could submit a draft constitutional revision to a parliamentary session later this year. He is proposing to add a clause to Article 9, which bans the use of force in settling international disputes. The clause would explicitly permit the existence of Japan's military, known as the Self-Defense Force. 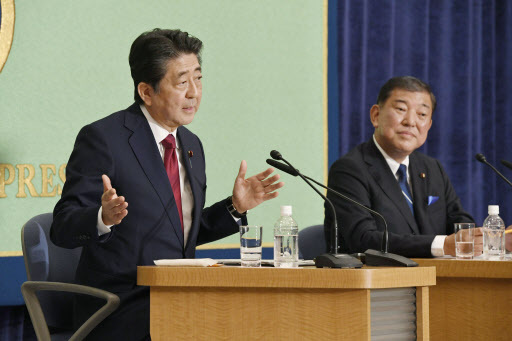 His coalition government holds the two-thirds majority needed in both houses to approve a national referendum on constitutional amendment, but the issue is controversial and it's unclear whether Abe could get enough votes for passage. For the public, the constitution is a lesser concern than issues such as pay, education and the high cost of child care, surveys show. Abe's agenda will include the country's aging and declining population and a royal succession in the spring. He also has to deal with security concerns stemming from North Korea's nuclear and missile threats, as well as intensifying trade friction with the U.S. which could shake his friendly relations with President Donald Trump. Abe has survived a series of scandals, including cronyism allegations against him and his wife, Akie. Despite attacks from opposition parties and criticism in the media, his public support ratings have recovered to about 40 percent, considered high for a Japanese leader after five years and eight months in office. Party members credit him with leading the party to major victories in national elections.